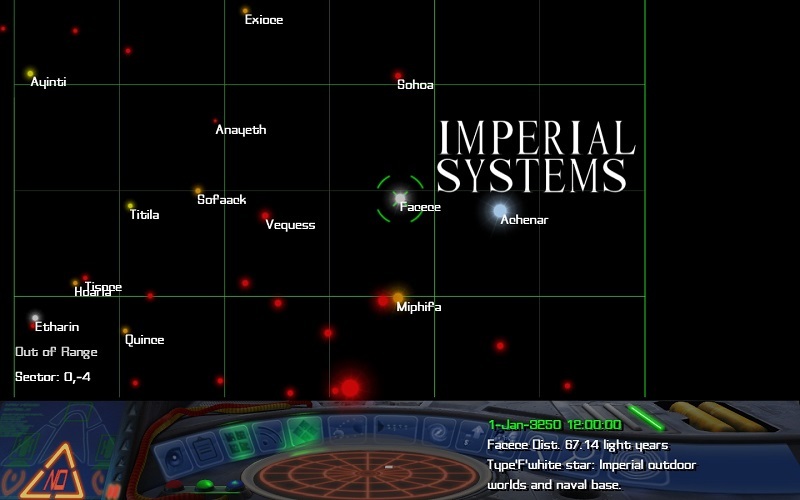 Here is the galactic map showing the region of space where you can accumulate ranking points more quickly than anywhere else in Federation space. 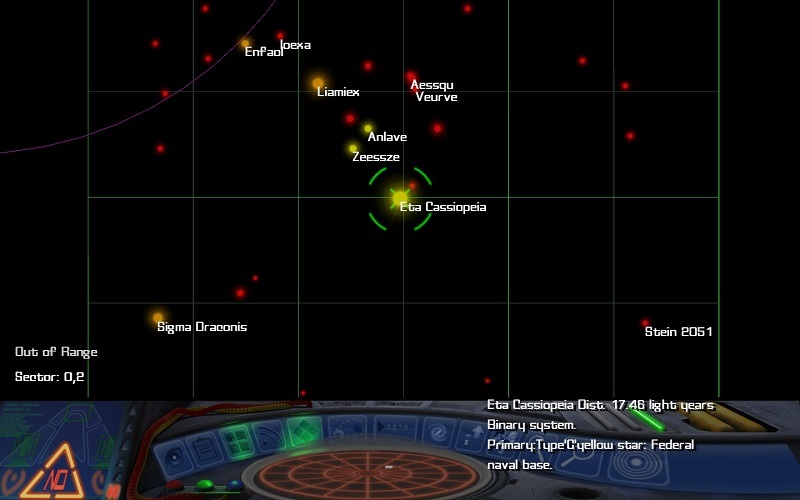 Dock at one of the spaceports in the Eta Cassiopeia system (J.F. Kennedy is always a good bet) and check the bulletin board for the familiar Federal Military advertisement. With any luck, they should offer you numerous missions to AC+79°3888, an unremarkable system just 8.46 ly away. Generally, you'll be offered at least 8, and sometimes as many as 14 simple courier missions there. 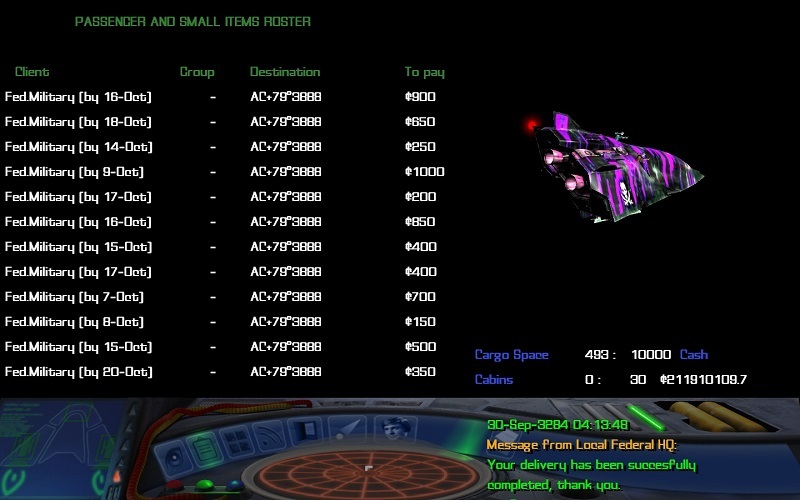 If you've got a reasonably fast ship you should be able to accept all of them and complete them on time. If you'd rather work for the Empire then this is where you need to be, the region right at the centre of the Imperial systems. I call this area the Imperial Triangle, as you can gain ranking points extremely quickly by flying from Facece to Vequess, then Vequess to Sohoa and finally from Sohoa back to Facece, picking up missions as you go. Again, make sure you know what your ship is capable of and that you'll be able to complete all the missions you take on before the deadline. If in doubt, do a test run between the systems and make a note of how long your particular ship takes. Going back to the Federation, this shows the list of missions I have accepted from the military at J.F. Kennedy. There are actually 14 missions here which will gain me 28 ranking points. While you're here, if you have any spare passenger cabins it is always worth looking again at the bulletin board in case anyone wants to buy a lift to AC+79°3888. You can haggle with these people as well, whereas with the military it is always best to just accept the price they are offering. Once arrived at AC+79°3888, the local Federal military will award you the money and points for each successful mission. Don't forget, if you're late on any of these, you won't be paid and points will be deducted. Too many and you might even be demoted! If you find the local military a bit slow in getting through a long list of missions, you can always activate your Stardreamer control on Level 3 and speed things up a little. 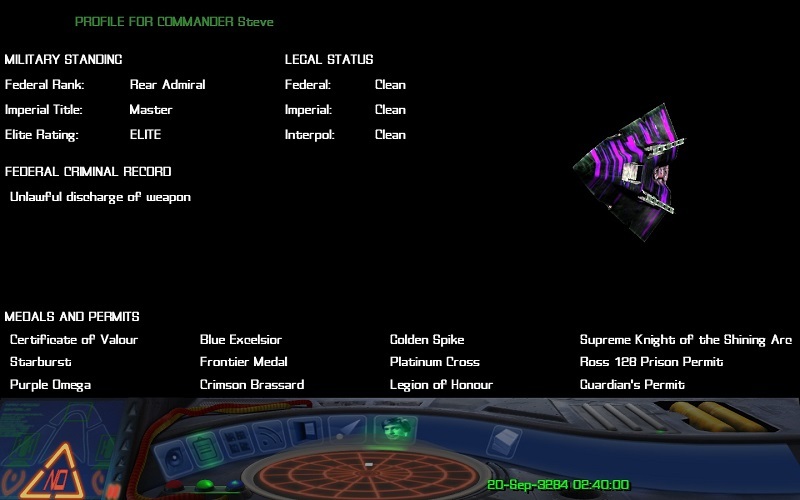 This is how Commander Steve's personal profile looks at the moment. 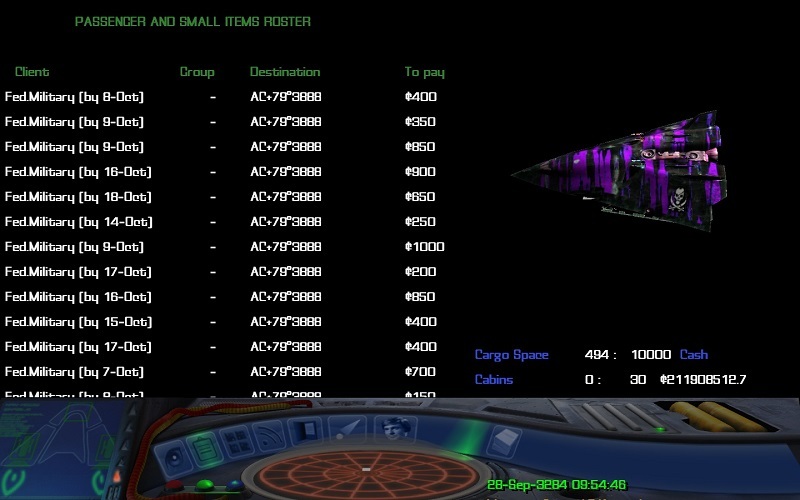 Your actual points total is always kept secret, so the only way you'll get to know of a promotion is when this display on your ship's computer shows a different rank against your name for one of the military organisations. Points earned for a rival superpower count against you with your current employers. So for example, if you rise to the rank of Commodore in the Federal Navy - by amassing 10,000 points - and then decide to switch to the Imperial Navy, you effectively start on -10,000 points. This means you'll need to accumulate 10,256 points (or 5128 delivery missions) for them to start offering you assassination missions! This is despite the fact that your rank will be reflected as per the table above. The above tables give the ranking points obtained for each type of military mission and how many of those points are required to advance to the next rank. Concentrating on the Federal run between Eta Cassiopeia and AC+79°3888 and sticking to delivery missions (worth 2 points), if we assume an average of 10 missions are taken on each time then we can calculate the number of runs required between the two systems to move up each rank. 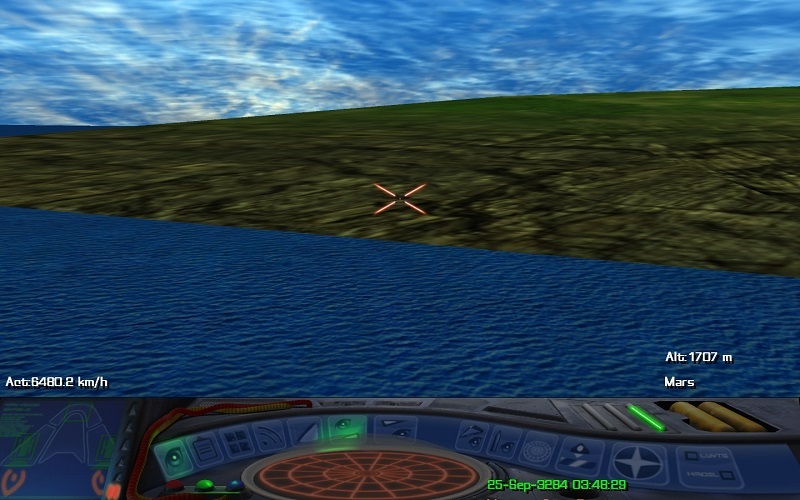 From the table above, it is clear that continuing with delivery missions will enable the Frontier pilot to achieve higher rank in a shorter space of time. If he or she embarks on a military career in 3250, they would, by this method, become Admiral in around 3264, having completed 1037 delivery runs, or 10368 individual missions! Though the rank at which bombing missions start to be offered is unclear, it appears that using this method consistently through the rest of a pilot's career would add 20 months to the time to reach Admiral, having carried out 1152 bombings. However, these figures should be treated with caution. A number of assumptions have been made, especially in the time required to complete one delivery run or one bombing. 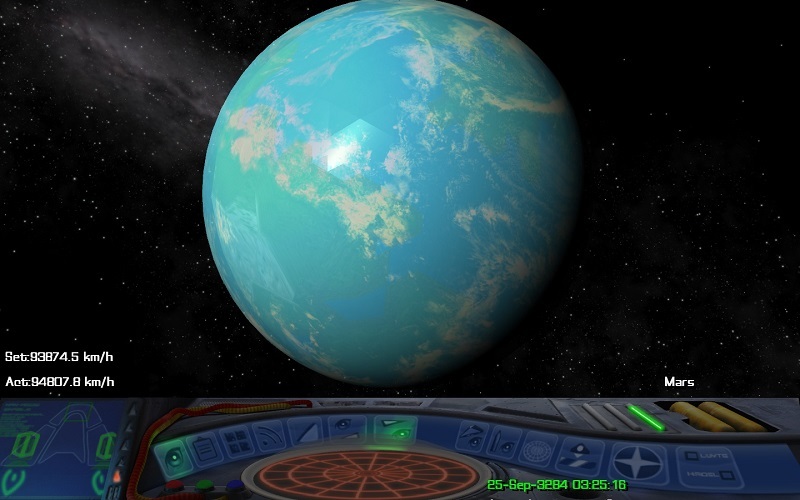 The actual time taken for bombings depends on many things, such as the hyperspace range of the pilot's ship, the distance between the system where the mission is accepted and where the target is, and the acceleration of the ship when flying from hyperspace egress to target. In many cases, therefore, missions will take considerably longer but the comparison between deliveries and bombings should still hold true as each type will take a similarly longer amount of time, only the actual time will change (still following this?) Also, as the pilot progresses up the military ladder, they will normally acquire faster ships thus the time taken will come closer to those used for the table above, ie 5 days for a delivery run and 5 days for a bombing - reasonable times for a Thargoid warship! Finally, account must be taken of the greater interest the pilot will find in taking on many varied types of mission rather than the tedious delivery of documents to space stations. In order to achieve the promotion to Admiral via deliveries, the pilot must remain on the Eta Cassiopeia - AC+79°3888 run for around 14 years, a depressing thought if ever there was one! Deviating from this run would perhaps save the pilot's sanity but would add months to the time required for promotion due to fewer missions being offered elsewhere. Bombings, on the other hand, plus photographic missions and assassinations are much more varied and still promise promotion fairly quickly. Be aware that these missions are not as plentiful as deliveries, and are much more dangerous. 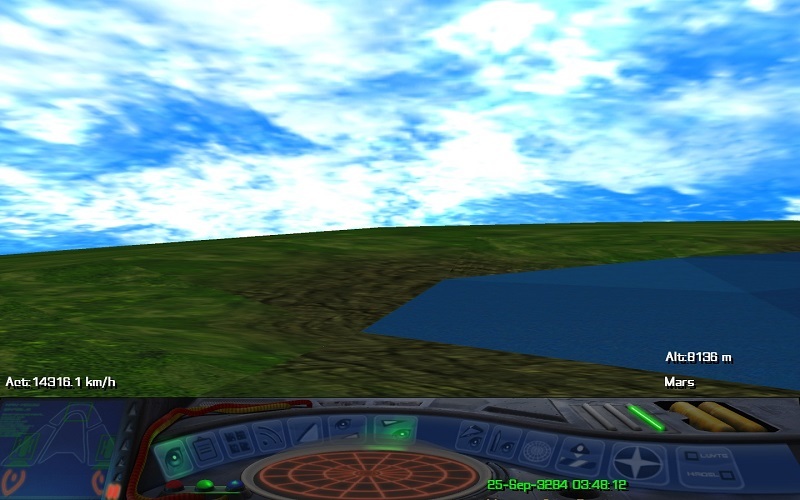 In the end, as is the case with just about everything else in Frontier, it is up to the individual pilot what he or she wishes to do with their life. Many will forego the higher echelons of military rank in order to pursue a more varied and interesting existence. It's up to you! !